We’re thrilled that we finally got our Arc’Teryx Theta SV Jacket back. After three months and eight emails (my original request email plus seven from the company) It’s been a long time coming but a least we have it back and they did a nice job with the repair. Yes, Back In Our Possession Again. We’ve Missed You Theta SV. Back in November of last year we noticed that the wrist cuff areas as well as around the waist where they seam seal it were frayed. Not a big deal but less than ideal for a $600 jacket. We looked up the Arc’Teryx warranty and saw that the process needed to be started with a warranty request via email. So email #1 in our 8-email story was sent on December 14th and then we waited for a reply. Email #2, the first from Arc’Teryx, arrived a quicker-than-expected one day later when they got back to us with this dearth of details message literally stating “Thank you for your Arc’teryx Warranty enquiry, we will contact you shortly with more information.” Okay, thanks for that useful update. The next day we received email #3 which included an RMA number and the steps needed to get our jacket repaired. We followed those to the letter and shipped it to the specified Blaine, WA address on the next day Monday, December 19th. Then we waited. And waited. Then waited some more. Finally one whole month after sending it away we received email #4 stating that it had finally arrived at its Canadian destination and that the warranty inspection/repair process would now begin. The next email from them (#5 for those keeping count) on February 1st stated that the inspection had been completed and they were finally going to send it to be repaired. The warranty wheels turn slowly but at least they are turning. So, okay, patience is a virtue. It’s already been two months so what’s another few weeks right? Plus we have our Mountain Hardwear Snowpulsion insulated shell so it’s not like we are at the mercy of the elements. After an extended stay at their facilities in Canada getting repaired we heard from the company again on March 7th letting us know that our jacket had been repaired and returned to their U.S. facility and that they would now ship it back to us in a few days time and would again send another email letting us know when that step had taken place. Two days later on the 9th we received the email letting us know that it had been shipped and giving us the UPS tracking number. Today March 14th our package arrived and after a brief inspection we are thrilled to say it has been beautifully repaired and ready to go back into service on our adventurous travels. Treating our stuff with care is an easy way to get the most out of our investment and allows us to use it hard without worry. If at all possible we choose to get our gear repaired or fix it ourselves. Extending the life of our equipment reduces consumption, waste, our environmental footprint and our cost and as poor bloggers that is a wonderful thing. As a side note, this is our second Arc’Teryx jacket. The first was a Beta AR which we used early and often for five years and when we sent it back for warranty repair the process was much the same as this experience except in that case they were unable to repair it. The process still took 3+ months and shipment across the Canadian border twice. Since they were unable to repair it though they offered me the option of purchasing a replacement jacket for half off. That was an interesting process in and of itself as they told me to pick the product I wanted off their website and then let the person handling my “case” what I wanted. Once I chose this Theta SV I called my representative and was quoted a $300 price (which is great for a jacket of this caliber), read her off my credit card info and the new jacket was soon en route. In addition they also said I had the option of them disposing of the old jacket or sending it back to me after marking it as, essentially, “warranty over.” Since the issues I had sent it in for them to repair were minor I chose to have it sent back and eventually donated it to a homeless vet that I know. He was happy to have it and I was happy to help him out. Win – Win. So, while the whole process took longer than we would have liked we understand that dealing with shipping product back and forth over a border (even a “friendly” one like Canada) adds substantial time to deal with the oh so efficient bureaucracies of two countries. 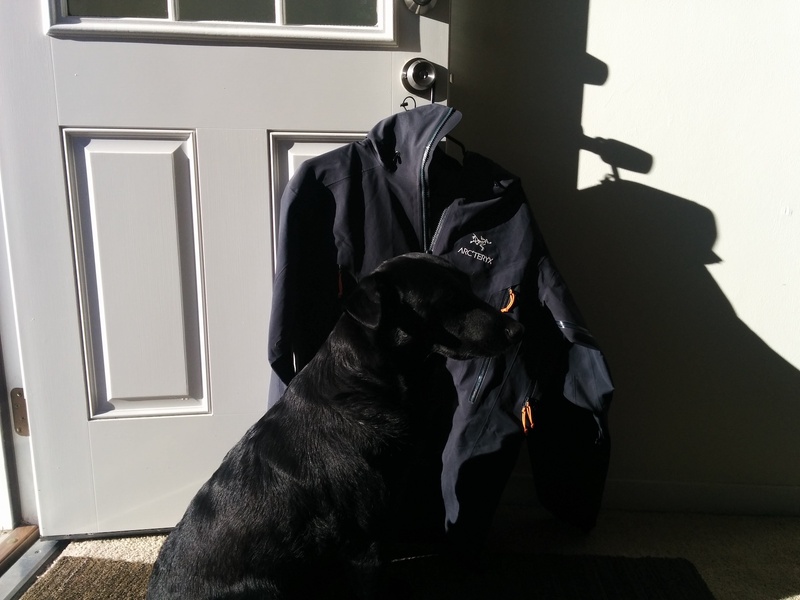 We are still impressed that Arc’Teryx stepped up and repaired our 10-year-old jacket for the small price of washing it, packing it up and paying to ship it to them. In retrospect, a total of $800, for two jackets, spaced out over 15 years (which comes out to about $53 a year) seems like a quality deal on my side of the ledger. Personally I didn’t need an email for each and every step of the process along the way but I can see how some people might like such corporate hand holding. Now all they have to do is open a new repair center in the United States and halve their turn-around time. Yes, I can be hired by corporations to tell them how to do things. Happily business is slow. Now stop reading and get out there on your own adventures, with or without a dog. We vote for with dog. I returned a jacket, due to 2 zippers failing. After a month of waiting, they informed me, that the jacket was too old to repair, even tho, it is still immaculate looking. They offered, 50% discount, on new BetaAR, or Rush jacket. However, they would keep, my old jacket. If I value my old jacket, at 200 Can dollars, then they are only giving me a discount of 150 dollars, which is 20%, approximately. 2o% discounts are common, even, on Arcteryx gear. I will keep my old jacket. Have it repaired locally, and look for a ski jacket, from a manufacturer, with integrity, unlike Arcteryx. I still have my Arc’Teryx shell but the vast majority of my outdoor gear is from Mountain Hardware. They’ve replaced zippers on jackets and a tent and repaired a hole in my sleeping bag, free of charge and no questions asked. Drop the item off personally to their facility in Richmond, CA and pick it up there a week later when heading back out of the area. It would appear they now have web forms to start the process, but whatever information you supply is a waste of time because when they finally reply, they ask you for the same information all over again. I made the mistake of thinking I was talking to an adult, and told them I had already supplied all the information they were asking for, and like a bunch of children they promptly and professionally ignored me. I am amazed at the good reviews talking about great customer service from Arc’Teryx, because from what I can see they are back in the stone age, perhaps still living on the arc. I won’t be buying anything else from them. “Good” customer service is subjective. In my opinion they have adequate CS. This is my second Arc’Teryx jacket. The first one needed repair and, back around 2005, I had to fill out a customs form (since it would be shipped to Canada) and it took a whole 3 months to get the jacket back. They “felt bad” about that and so sent along a logo beanie that was obviously from the seconds bin. A couple of years later that jacket needed another repair and this time they said it couldn’t be fixed and so offered me the opportunity to purchase a new jacket for half off and I did that. When this jacket finally dies I too will look for high-end jacket options from a different company.